It's 9PM on Valentine's Day and my wife is sound asleep on the couch. I'd like to think these shrimp were so good that she decided to call it a day, but it probably had more to do with the glass of wine she enjoyed after the kids went to bed. Regardless of the reasons for her slumber, there's no doubt in my mind she is dreaming of delicious grilled shrimp. This simple glaze can be thrown together quickly and it makes a great coat of deliciousness for some perfectly grilled shrimp and/or scallops. The key to grilling shrimp and scallops is to not over-cook. Overcooking produces a chewy texture in the shellfish, not a great experience. High heat, quick and direct heat on both sides and then hit them with some glaze at the end. Let's do this! 1Peel the fresh ginger by scraping it with the edge of a spoon and then grate or mince. I like to grate the ginger using a micro-planer. We need about 1 tablespoon of finely minced ginger. 2Mix the honey, soy, ginger, lime juice and zest in a small sauce pan and bring to a simmer. 3Simmer the lime, soy and ginger under low heat for about 10 minutes to reduce to a glaze. 4Preheat the grill to high heat and clean and oil the grates (important to lube up the grates, we don't want to have to pry off one of those beautiful shellfish!). 5Skewer the shrimp and scallops. 6Place the shrimp and scallop skewers over high heat and grill with the lid open for about 2 or 3 minutes. 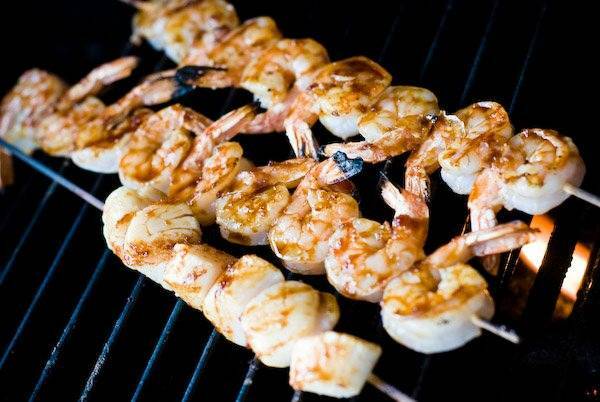 7Flip the skewers over to the other side and baste the shrimp and scallops with the soy, lime and ginger glaze. 8Grill for another 3 minutes on the other side and then flip the skewers over. 9Brush the other side with the glaze and then remove the skewers from the grill. We just want to hit the other side with the glaze, but don't let them grill too long on the "glazed" side or the honey will burn. I like to keep grilled shrimp and grilled scallops simple. This simple glaze is easy to throw together at the last minute and adds such great flavor to the dish. Give it a shot and let us know what you think!